Happy Valentines Day everyone!!! xoxo! As a token of our love and gratitude to our customers, we are giving away a FREE rose quarts nugget with every purchase at Epiphany Bead and Jewelry Studio for the month of February! As many of you know, different stones give off different metaphysical properties. Rose quarts invites love into our lives. It enhances the ability to give, experience, and receive love. It opens our heart chakra. It clears out anger, resentment and jealousy of others. It aids in healing heart issues, and dis-ease associated with the heart. Known as the romance stone, it can be used to attract love to us, and enhances relationships and intimacy. It aids in the healing of heartbreak and other emotional wounds. Rose quartz can be used in place of garnet as January's birthstone and is most associated with the zodiac sign Taurus. 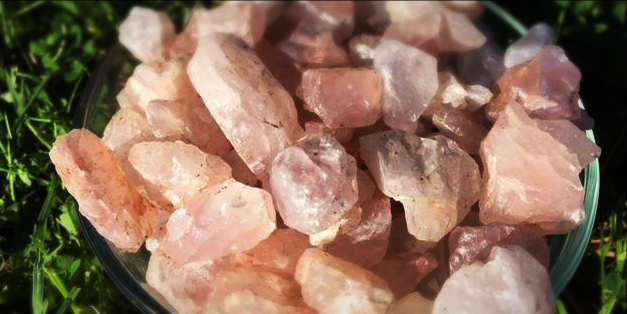 Rose quartz's metaphysical aspects work best when worn on the body especially close to the heart. (The little nuggets are great for wire wrapping and wearing as a pendant!) You can also use them during meditation or can place them in your home or bedroom to fill your home with love.